San Marco Chamber Music Society sets sight for Germany - The Resident Community News Group, Inc. | The Resident Community News Group, Inc.
More than 60 eager patrons gathered on Jan. 13 at Friday Musicale in Riverside to enjoy “Eine Kleine Nachtmusik” (A Little Night Music) performed by the San Marco Chamber Music Society. Coinciding with the Society’s mission statement “to educate and enrich the lives of people of all ages and incomes by presenting world-class chamber music concerts that are open and free,” the mission of that evening concert was to raise funds for the Society’s upcoming trip to Germany. The musical ensemble traveling to Germany will include co-founders Eric Olson (oboe) and Ellen Olson (viola), Aurica Duca and Clinton Dewing (violins), Nick Curry (cello) and Les Roettges (flute). In addition to showcasing some of Jacksonville’s finest musicians on the international stage, the June 2019 trip will include several local patrons traveling with the musicians to each venue. Audiences in Germany will be treated to a brilliant new piece composed by Jacksonville Symphony violinist Piotr Szewczyk specifically for the San Marco Chamber Music Society, entitled “The San Marco Suite.” Two movements from the San Marco Suite, “Midnight Waltz” and “Hendricks Avenue,” were performed Sunday evening at the fundraiser, after which composer Szewcyzyk approached the stage and joined the audience in applauding the players. 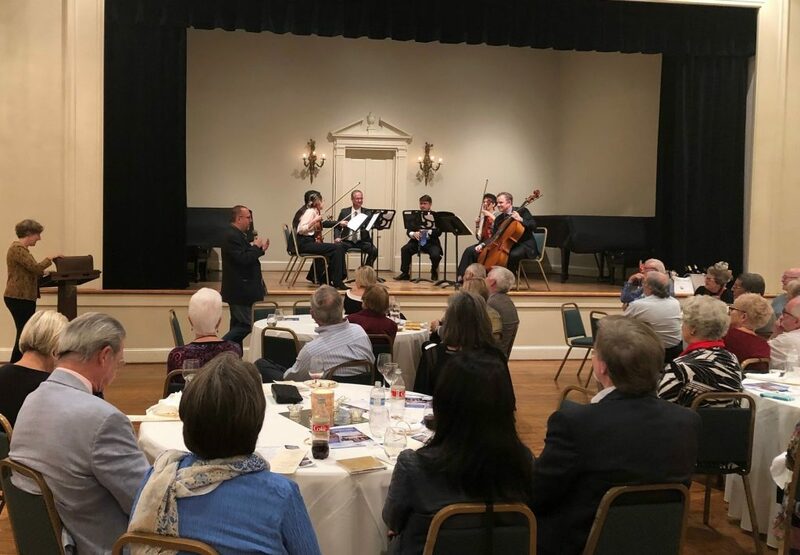 “Eine Kleine Nachtmusik” was a spirited evening featuring wine and heavy hors d’oeuvres and later, dessert wines and sweets, as well as a live and silent auction with several items that drew heavy bidding. Particularly popular were the in-home concerts offered by various members of the ensemble, as well as a framed original painting by Artist Anna Miller, inspired by the San Marco Chamber Music Society. Also quite popular with the guests was the Society’s new CD, “Songs and Dances,” just released by Albany Records. San Marco Chamber Music Society performing at Friday Musicale. The San Marco Chamber Music Society has several concerts coming up at their regular venue of St. Mark’s Lutheran Church, 3976 Hendricks Avenue, the next one being “Got Vivaldi?” on Sunday, Feb. 10 at 7 p.m.
For information on the Germany trip, or upcoming concerts, visit www.sanmarcochambermusic.org, or call Erik and Ellen Olson at (904) 731-1310.